Cape Town is at the center of a major El-Nino-triggered drought, which began in Southern Africa in 2015 and continues today as annual rainfall in the region had decreased by as much as 75 percent. Once viewed as a leader of water management, the city of Cape Town is under pressure to ration its distribution and use, as water reserves had approached 13.5 percent total capacity. Cape Town's growing population and increased water usage per person exacerbated its water problem. Since the beginning of the twenty-first century, the city’s population has increased faster than Cape Town’s ability to store water. Predictions of reaching the low of 13.5 percent capacity were initially set for April 2018, “Day Zero” for Cape Town, when taps in the city would run dry. The dams are now at almost 19 percent. Feeling the pressure of supplying water for a city of four million people, an attempt to mitigate the water crisis was to direct the city's water distribution to selected taps and limit each person to 50 liters (13.2 gallons) per day. For perspective, the average amount of water used per person in Massachusetts is 246 L (65 gallons) and a five-minute shower typically uses between 10 and 25 gallons. After a period of rationing, the adoption of other policies, and much needed rainfall, new predictions have pushed backed estimates of Day Zero to August 2019. While the water crisis in South Africa is not the first, its resulting impact on Cape Town sets a precedent for water security, urban development, and response in the modern era. As people throughout the region relocate in search of water, host communities struggle to supply an increasing population with not only water, but also other resources such as food and housing. To meet this growing demand, local and national governments work with experts to create solutions to distribute water efficiently and decrease waste. NGOs work to create awareness within the communities. 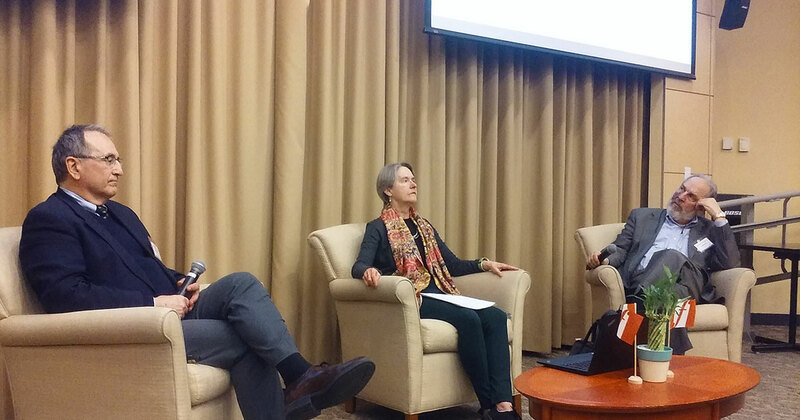 As part of this year’s Water: Systems, Science and Society (WSSS) symposium, the Fletcher School's Science Diplomacy Club organized a conversation discussing this issue, Day Zero: Water Crisis South Africa. The panel was moderated by Dr. Ann Rappaport of the Urban and Environmental Policy Department at Tufts, with presentations by Dr. James Cullis of Aurecon South Africa, Dr. Kenneth Strzepek of Harvard’s Kennedy School, and Dr. Lawrence Susskind of MIT. Dr. Cullis began the conversation by describing the present situation which Cape Town faces: the water levels and timeline, rationing of water and policy, and the ability to conserve. Dr. Strzepek followed this with a discussion on economic development surrounding the water crisis and the rising concerns of efficient water use in agriculture (62 percent of South Africa's water is used for agriculture while only producing 4.32 percent of the nation's GDP). Dr. Susskind emphasized the need for collaboration to occur between the communities and the policy makers to ensure that policies are meeting the specific need and interests of the various communities within Cape Town. The question and answer period led to further discussion between the panelists, which brought to light viewpoints, opportunities, and future collaborative efforts. Dr. Susskind touched on the point that nations and states sell water at a set price, leading to an imbalance between different socio-economic groupings. He and Dr. Cullis also discussed the pros and cons of increased desalination plant research and development for Cape Town and other coastal communities as alternatives to water tables and rain. By renovating infrastructure, water can be be used more efficiently, allowing for the redistribution of unneeded resources to other sectors and regions throughout the country. Echoing comments Dr. Susskind made earlier, Dr. Strzepek ended the discussion emphasizing the need for collaboration among representatives from the varying levels of government, development, and society. With such collaboration, policy and projects can be created to benefit all stakeholders. Joint efforts are more effective in the creation of successful, lasting legislation and projects. What remains to be seen is the length of time current water restrictions in South Africa will endure. Dr. Cullis is hopeful that citizens of Cape Town will see an increase in daily rations from 50 liters of water (13.2 gallons) per day to 150 liters (39.6 gallons) in the near future. The Science Diplomacy Club, led by Jonathan Keenan, would like to thank the Institute for Global Leadership for its financial support and the WSSS Symposium team for collaborating in organizing the panel and the symposium as a whole.